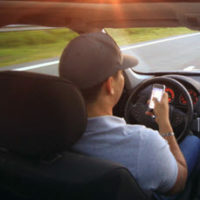 It is estimated that one road accident occurs every 24 seconds in the United States due to distracted driving. The National Safety Council reports that around 1.6 million crashes annually are due to the use of mobile phones in general, while another 1 million occur because of texting behind the wheel. Amidst greater clamor for road safety and new technology for safer cars, American roads are still getting deadlier. Traffic fatalities rose nearly 6% in 2016 to as much as 37,461, with a staggering 4.6 million more injured due to traffic accidents. Poor driving behavior is seen as a significant factor in these frightening figures, and one of the most important fronts in national and state efforts to lessen road accidents. These figures are all too familiar to today’s drivers, with road fatalities on the rise year on year. In fact, many are aware of bad driving behavior like texting, tailgating, line cutting, and speeding. The problem, however, lies in how they view themselves. This self-saving bias, however, is deadly. Driving under the influence of alcohol or drugs, driving tired, and speeding are the top three most fatal bad driving behavior today. The key to combatting bad driving behavior and making America’s roads safer, then, is to be able to call out bad drivers accurately, reliably and consistently. Like many things, this is easier said than done. CBS News reports that as many as 17 states are dangerously behind on adopting road safety laws, while many others are having a difficult time enforcing existing ones. Because of this, more and more organizations and regulatory bodies are looking towards the use of technology in furthering the safer roads cause. Smartphones are getting “Driving Modes” that minimize distractions and temptations to text or call while driving. Developers are working on cars that have breath or touch sensors that analyze a person’s intoxication levels before the engine is allowed to start, effectively preventing them from driving if their blood alcohol levels are too high. In terms of trucking, which one of the most crucial sectors on the road, a combination of regulations, like those described in our video FAQ here at the Marianne R. Howanitz Accident and Injury Law blog, and IoT technology is paving the way for safer fleets. The Federal Motor Carrier Safety Administration (FMCSA) recently enforced a mandate that requires the use of electronic logging devices (ELDs). Fleetmatics elaborates that these ELDs serve to help drivers and fleet operators comply with maximum drivers’ Hours of Service (HoS), while also tracking data on vehicle status. In this way, truck drivers will be prevented from driving while exhausted and protecting both the driver and the commuting public from the dangers of doing so. Changing drivers’ behavior for road safety can be a daunting task for governments and traffic regulators, but with the help of strict laws, good enforcement, education, and technology, a brighter and safer future might just be underway.